My son, Brooks Barrett Black, 21, died of a gunshot wound to his back on December 31, 2001, while on a hunting trip in Nevada County, California, about an hour’s drive from our home. On January 1, 2002, Detective Kropp, the detective in charge of the investigation, assured Brooks’ father and me that the death would be investigated as a homicide. 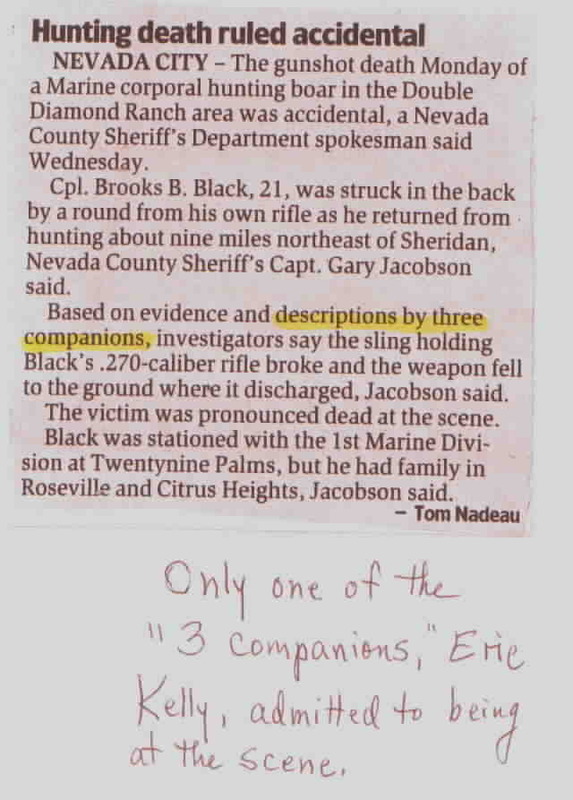 We later learned that the Nevada County Sheriff’s Department had determined at the scene that the shooting was an accident, based solely upon a very brief interview with Eric Kelly, a man who was with Brooks when he was shot. Eric has since admitted to lying during that interview, and the two other members of the hunting party, Chris Tourville and Jeff Hughan, have told stories that are filled with inconsistencies. It’s obvious that something occurred out there in the woods that night that has all of them terrified. When Brooks was a teenager, he became acquainted with Chris Tourville while working with him at a party supply store. In 2001, when Brooks was home on Christmas leave from the Marines, he heard that Chris and his friend Jeff were going pig hunting and asked if he could join them. Jeff checked with Eric Kelly, whose family owned the property, and got permission to bring Brooks along. Brooks was not close friends with any of these men, all of whom were fifteen years older than he was. The next thing we know for certain is that, on Dec. 31, at about 6 a.m., the Higgins Valley Volunteer Fire Dept, received two 911 cell phone calls directing them to an access road to the Double Diamond Ranch. One of those calls was from Jeff Hughan, and the other may have been from Rick Corter, Eric’s neighbor, who had come upon Eric providing CPR to a man who was lying on the tailgate of Jeff’s pickup truck. When EMTs arrived, Mr. Corter told them, “Something fishy is going on here. These guys have told several different stories in the last ten minutes.” Later, when Brooks’ dad and I spoke with Mr. Corter, he told us that Eric Kelly has a very hot, flash temper, especially when he’s on drugs. We have since learned that Eric has been jailed for drunk driving and resisting arrest. Chris Tourville has been convicted of six felonies (one count for being a felon with a firearm, two counts of burglary, two counts of receiving stolen property and one count of grand theft). Chris has served a total of 490 days in jail for these crimes and 30 days for violating his parole. From there on, everything is hearsay, and the stories told by Jeff, Eric and Chris conflict with each other. Even something as seemingly innocuous as their supposed arrival time at the hunting site is a study in contradictions. The men agreed to drive to Eric’s property on the evening of the 30th, so they could get an early start hunting in the morning. Jeff told deputies that he and Eric rode together, Brooks and Chris rode together, and they all arrived at Eric’s trailer between 6:30 and 7 p.m. Chris stated they got to the trailer between 8-8:30. Eric stated they got there at 9 p.m. And, Jeff’s wife, in an apparent attempt to distance her husband from anything that went on that night, stated that she saw Jeff and Brooks leave at 4:30 a.m., which would have put them at the trailer at 5:30 a.m. The men all admit they were drinking, but say that Brooks drank very little. Then they reportedly went off to scout out the areas they would hunt in the morning. Chris stated that Eric would not allow any of them to carry weapons. 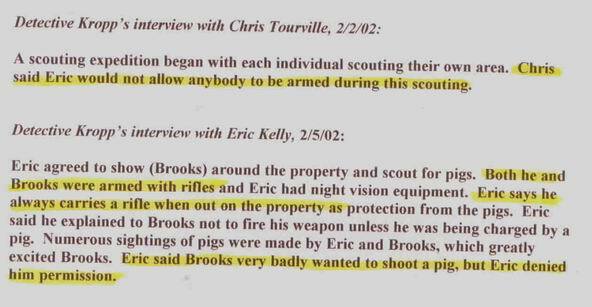 Eric stated that they all carried weapons and that he and Brooks had night shooting devices (for a scouting trip?). The men allegedly returned to the trailer at about 11 p.m., with Brooks very worked up, because they had come upon a pack of 15-20 pigs and Eric had refused to let him shoot one. The stories go on and on, raising far more questions than they answer. Chris says that he, Eric, and Brooks rose at 4:45 to go hunting, with Chris armed with a bow and arrow. (Why would Chris go hunting when he wasn’t permitted to shoot?) Yet Eric maintains he never saw Chris that morning. Jeff says he slept late, but when he heard a shot -- Brooks’ death shot -- he grabbed his rifle and went rushing out to start hunting. (Why, when Eric had refused him permission to shoot?) Then there’s a jumble of contradictory information about who was where and who did what. None of it makes sense. The Sheriff’s Department did not conduct official interviews with any of these men until our family forced them to do so. Jeff was finally interviewed on Jan. 10, and Chris on Feb. 2, (Det. Kropp told me he hadn’t known Chris existed). Eric hid from the law until we finally tracked him down through a girlfriend, and he was interviewed on Feb. 5 and again on Feb. 18. Feb 18 is when he admitted to lying about not carrying a gun. When Det. Kropp told me he had found no discrepancies in Eric’s story, I pointed out that glaring discrepancy and asked him, “What do you call that if it isn’t a discrepancy?” Det. 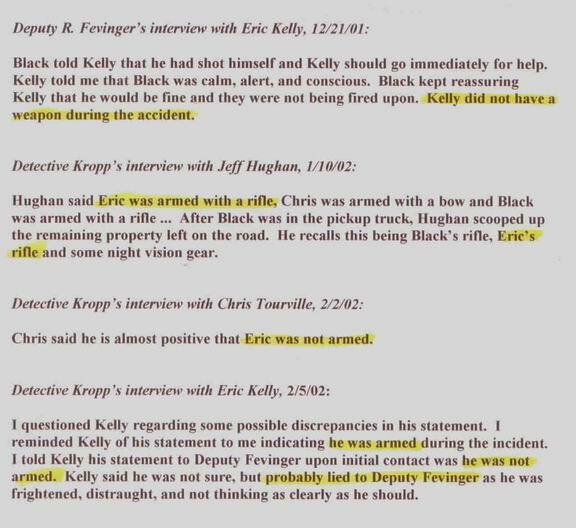 Kropp responded, “I call that telling one person he didn’t have a gun, because he didn’t want them to know he had a gun, and telling someone else he did, because he didn’t care if they knew he had a gun.” I said, “I call that a lie.” He did not agree. But the problems with the investigation go far beyond the tangled statements of the witnesses/suspects. After deputies left the scene, Vern Butler, the owner of an adjoining property and a 30-year veteran of law enforcement, went to the paved road where blood was still present, and was so convinced that it was pig blood that he scooped up a handful of blood and tissue and placed it in a Zip-lock bag. He, then, noticed drops of blood going off the paved road into a field. He got down on his hands and knees and followed the blood trail all the way to a creek. “That’s where your son probably got shot,” he told us, (a strong possibility in light of the autopsy report, which says Brooks’ feet were wrinkled as if they had been submerged in water and there was a sandy brown soil on his lower legs.) There were also unexplained scrapes and contusions on Brooks’ torso, which could have been caused by his being dragged to the road. Mr. Butler believes somebody may have placed a slaughtered pig on the road to make it appear that my son had been shot and bled to death on a public access road rather than on private property. Based on the level of coagulation of the blood and the fact that Razorback pigs are nocturnal, Mr. Butler believes the hunt took place at around 2-3 a.m., (about the time of the alleged “scouting trip”), which would have given the men plenty of time to manipulate the scene and concoct a story by 6 a.m., when the calls to 911 were made. Mr. Butler took the blood and tissue samples to Captain Jacobson of the NCSD and requested that the case be investigated as a homicide. Captain Jacobson refused to accept the blood sample. In the meantime, Jeff Hughan washed all the blood off the road. There was literally no crime scene or forensic investigation. No evidence was collected. No stress test was performed on the rifle strap. Ballistics was not asked to determine which way a rifle would fall if it slipped off my son’s shoulder. No alcohol or drug tests were performed on the three witnesses/suspects, and their clothing was not processed for blood spatter. Their hands and clothing were not tested for gunpowder, and their rifles were not confiscated, although ballistic tests could not verify that the bullet that killed my son came from his own rifle. I can’t say for sure which individual was responsible for Brooks’ death, but I’m willing to speculate about the circumstances. If he was shot from close range, I believe someone yanked Brooks’ gun strap to prevent him from shooting a pig, breaking the strap and firing the gun into his back. If he was shot from far off, it could have been a simple accident, a stupid move on someone's part thinking my son was a pig. The worst scenario of all is that it was planned for someone to shoot Brooks and to pass it off as an accident. If that was the case, the killer(s) could have pulled the strap after the fact to break one side. My strongest inclination is to believe someone pushed Brooks down, pulled back on his rifle, and discharged it into his back. Rick Corter told us that Eric has a flash temper and has stopped other men from shooting when they were taking aim. Eric even said in his statement to law enforcement that he wouldn't let Brooks or anyone else hunt unless he gave them a go-ahead. Det. Kropp told our family that the Double Diamond Ranch is a well-known hangout for alcohol/drug abuse and hunting. 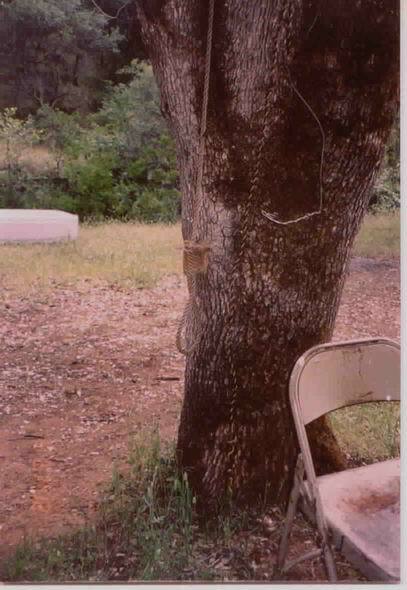 About five feet from Eric’s trailer there’s an oak tree with a hangman’s noose. 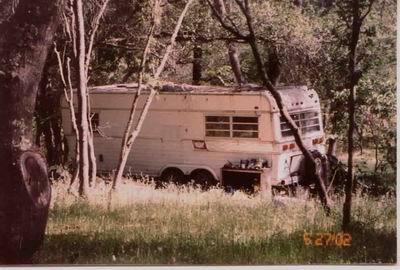 The trailer itself has a bullet hole in it and a sign in the window saying, “NO TRESPASSING. 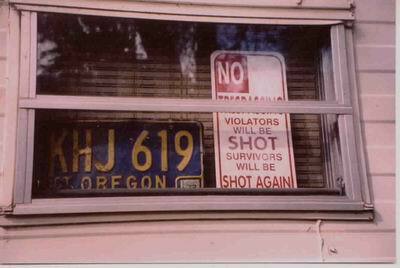 Violators will be SHOT and survivors will be SHOT AGAIN.” Det. Kropp told us, “We all knew something like this would happen eventually.” He said that, two weeks prior to my son’s death, these same men were involved in yet another hunting incident on Eric’s property in which a man’s leg was broken and he had to be life-flighted out. Vern Butler, the retired CHP, commented to us that he didn’t understand why the Eric and his friends called all those emergency people because they didn’t want to move a man with a broken leg, yet thought nothing of transporting my critically injured son in the back of a truck up a very long and rugged road. Det. Kropp said the deputies who came to the scene "screwed up" by calling it an accidental shooting and that Brooks’ shooting should have been investigated as a homicide. There is no statute of limitation on murder. All I am asking is that Brooks’ case be reopened and properly investigated, hopefully by a different agency. (1) The Attorney General is looking into Brook's case. Winchester has done testing on Brooks’ rifle and found it did not discharge when dropped with the double safety off. This is in direct opposition to the Department of Justice report stating that Brooks' rifle discharged every time it was dropped from 18 inches. 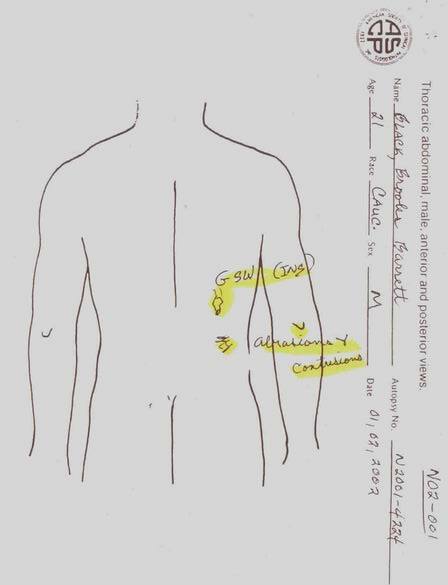 (2) I received transcripts from the two hour interview with the Pathologist who performed Brooks' autopsy. He verified that Brooks’ wound to the back was a "Distant Wound.” This supports the possibility that someone else shot Brooks. His stomach contents were partially digested, which means he had eaten two to four hours before his death. His alcohol level was zero. This supports the belief that Brooks arrived at the trailer around 8-9 p.m. He didn't drink alcohol because he was going hunting that night (what his comrades termed "the scouting trip"). When they went "scouting” around 10 p.m. he was most likely shot and died. That leaves several hours in which he probably didn't receive any help, because the men needed to prepare a story to clear themselves of his death. support my belief that Brooks was shot at night and didn't receive medical attention for hours. find!" This statement leads me to believe that they just don't want to look for it, or they stored it improperly, or they destroyed it. the night he died. So far, he agrees that the three are lying, contradicting, and covering up "SOMETHING." He has not completed the testing but will in the near future. (4) I have found a letter my son wrote in which he states that his wife, whom he was divorcing at the time of his death, had told him she knew a guy who would kill him if she requested it. Their divorce was very bitter. His soon-to-be-ex, being a Marine herself and being Brooks’ legal wife, would have had information regarding my son's $250,000 life insurance policy. She had been the original recipient of the life insurance, but my son, most likely without telling her, had changed the beneficiaries. She thought she was going to get his life insurance, although she wasn’t. I will update this again when I get new information from the Attorney General's Office.